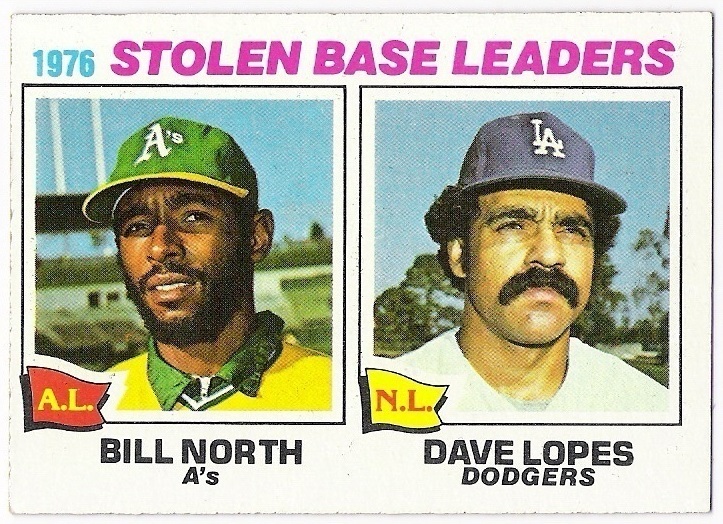 1977 was the year i first started following baseball and the dodgers in particular. 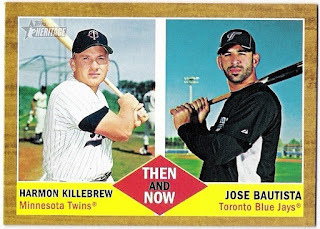 it was also the first year i opened a pack of baseball cards. 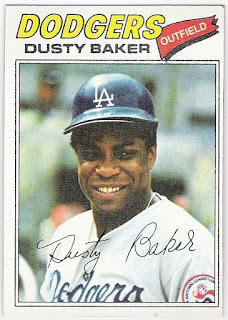 one pack was all i opened that year before spending all my allowance on packs of cards in 1978.
here's a look at what the 1978 topps dodgers were doing in 1977. starting with johnnie b. baker. 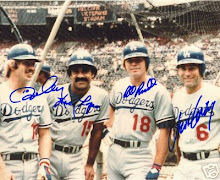 with newly acquired rick monday in center, the dodgers moved dusty to left in 1977. he wound up having a great year, with 30 home runs, 86 rbi, a .291 average and an ops of .876. it took dusty all season to get to 30 homers, joining teammates steve garvey, ron cey, and reggie smith as the first foursome in history to each belt 30 in a season. baker's 30th came on the last day of the season, and was one of 3 solo home runs the dodgers hit off of jr richard in the 6th inning. glenn burke followed dusty's blast with one of his own (manny mota had homered earlier in the inning), and legend has it that burke gave dusty the first 'high-five' prior to his at bat. 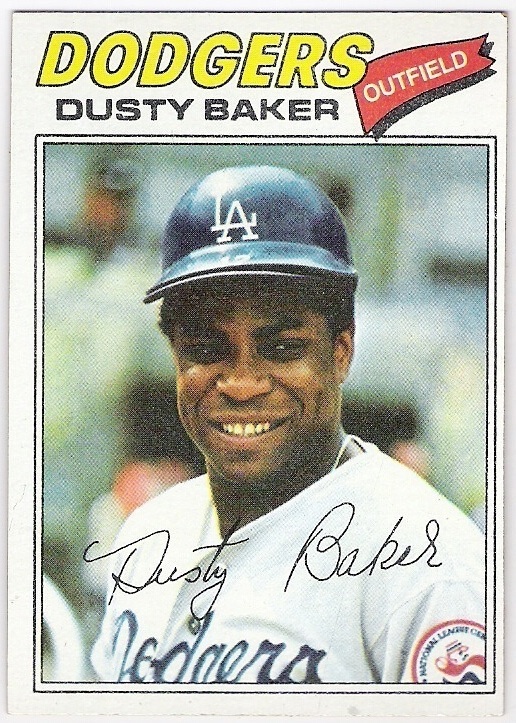 baker hit .357 in the nlcs against the phillies in the 1977 postseason. he had 2 home runs and 8 rbi and was named mvp of the series. in the world series against the yankees, baker he hit another homer and drove in 5 runs while hitting .292 in the dodgers' 6-game loss. the penguin hit 30 home runs and drove in 110 in 1977. both were career highs. cey started the all-star game at third for the national league for the 3rd time in 4 years and finished 8th in the national league mvp voting. 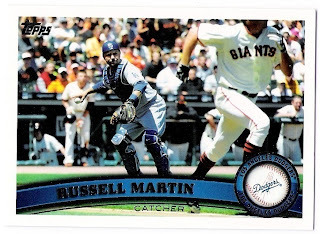 in the midsummer classic, he was 0 for 2 with a walk and a strikeout, but he hit .308 when it counted - in the nlcs. 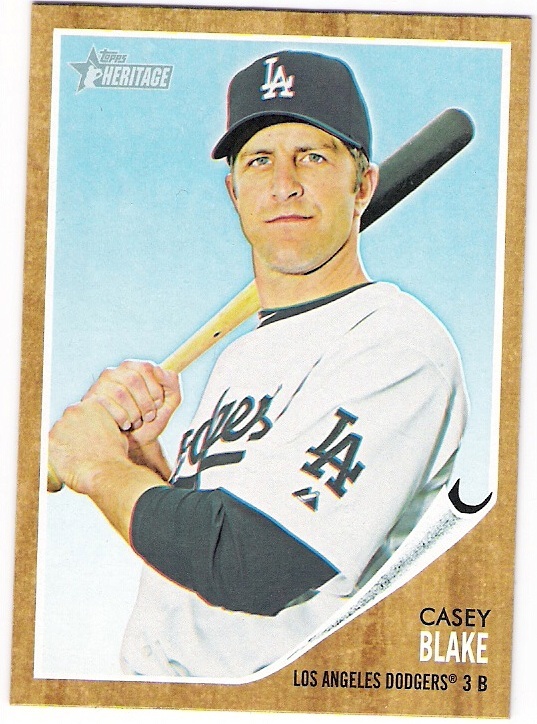 against the yankees, cey was just 4 for 21, but he did have a double and a home run to his credit in the series. 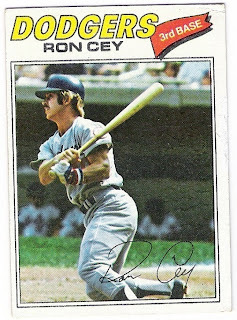 cey also set a major league record for rbi's in the month of april with 29 in 1977.
even though topps still had him as a member of the white sox, forster had been traded to the pirates in december of 1976 with goose gossage for richie zisk. 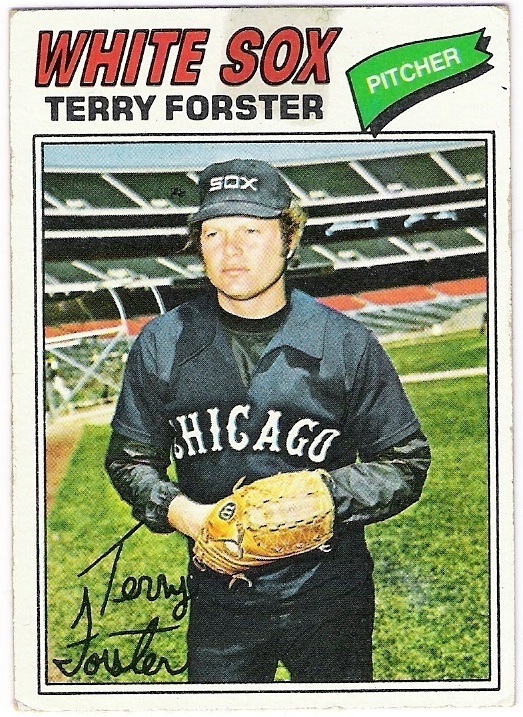 in pittsburgh, forster went 6-4 with a save and a 4.45 era. he made 33 appearances, including 6 starts. the best thing about being in the nl was that forster got to bat again. he had 27 plate appearances in 1977, and hit .346 with a double, a triple, and an rbi. he struck out only 4 times and had a sacrifice for good measure. after the season, he became a free agent and signed, of course, with the dodgers. 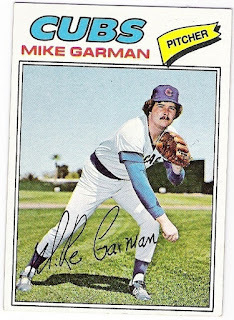 mike garman was another guy improperly depicted by topps in 1977.
he was acquired in january by the dodgers along with rick monday. 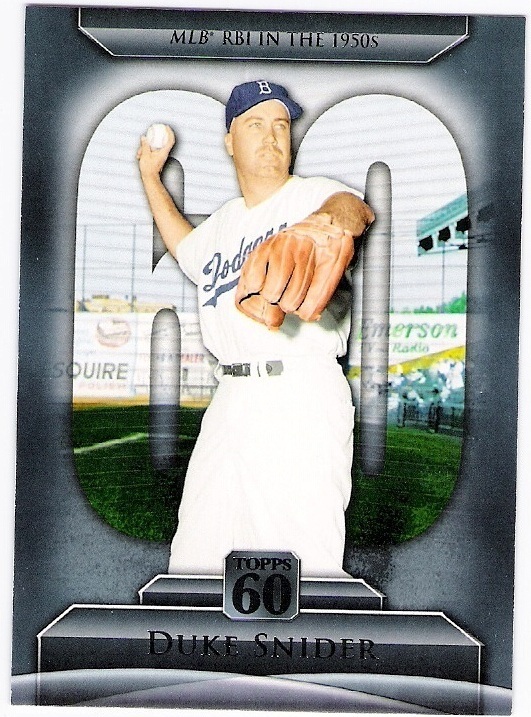 garman gave tommy lasorda another option in the bullpen, and he responded with 12 saves in 49 relief appearances. he sported a nice 2.73 era, and had an even record of 4 wins and 4 losses. garman made 2 scoreless appearances in each the nlcs and the world series. 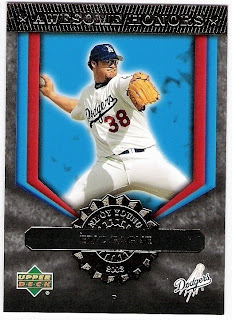 in fact, he earned the save in game 3 of the nlcs - the 'black friday' game. 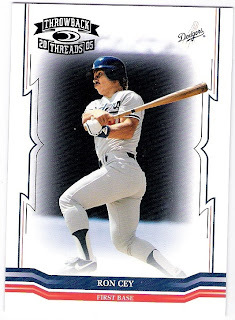 steve garvey swung for the fences in 1977.
that's what the back of his 1978 topps card says, and i believed it when i saw his stat line of 33/115/.297. tommy lasorda asked garvey to hit more home runs so he did, while sacrificing his average a bit. he got only 192 hits in 1977 and hit below .300 - both oddities in his stats as we look back on them today. had he reached each of those milestones in 1977, garvey would have had 7 straight seasons with at least 200 hits and 8 straight with an average of .300 or better. garvey repeated for the fourth season in a row as the national league's all-star game starter at first base and its gold glove recipient while finishing 6th in the league mvp voting for the second time in a row. in the postseason, garvey hit .308 in the nlcs (although he went without an extra base hit) and .375 in the world series, where he had an ops of 1.025 thanks to a double, triple and home run. 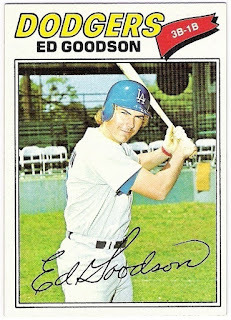 ed goodson played his final big league season in 1977.
he saw limited action at first and third over the course of the season, and made by far the majority of his appearances as a pinch hitter. overall, goodson hit just .167 with a homer and 5 rbi. 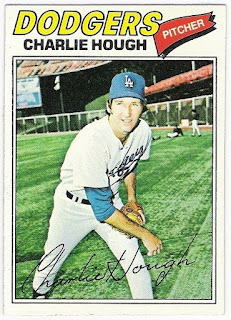 that last home run of his career came in a june game against the braves in which goodson pinch hit for mike garman to lead off the top of the 9th inning with the scored tied at 2. charlie hough came in to replace goodson in the pitcher's spot and shut down atlanta to earn the save. 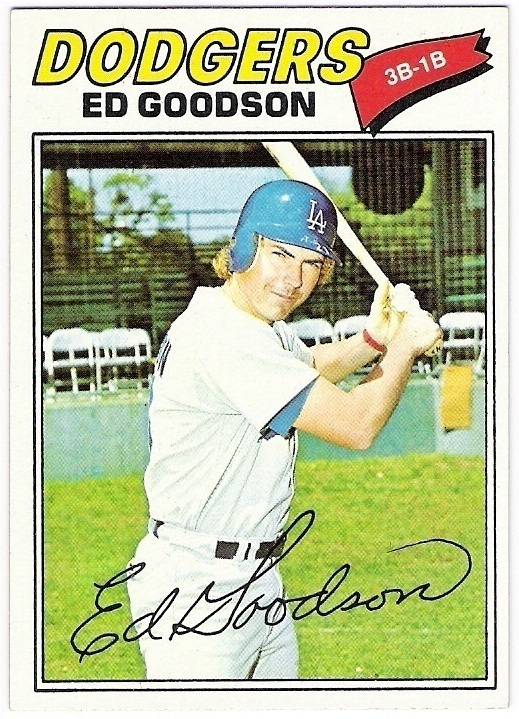 goodson made two pinch-hit appearances in the postseason, one each in the nlcs and world series. in what would be his final at bat as a major leaguer, goodson struck out in game 6 of the fall classic against mike torrez. 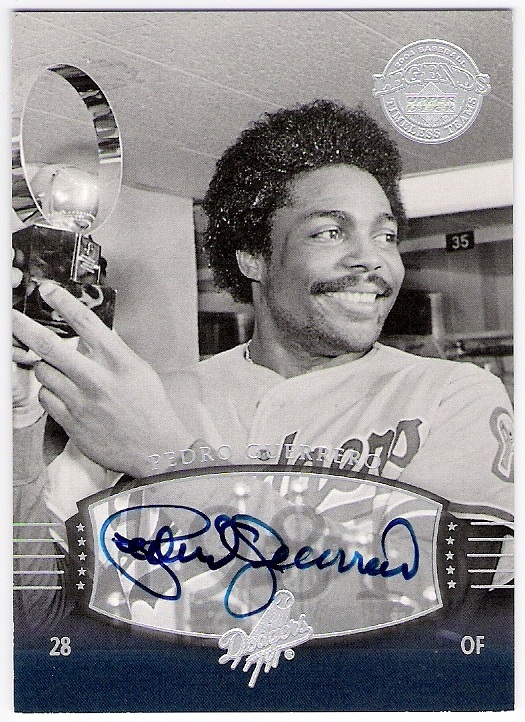 the dodgers released goodson during spring training in 1978, and although he signed with the indians shortly thereafter, he never again appeared in a big league game. 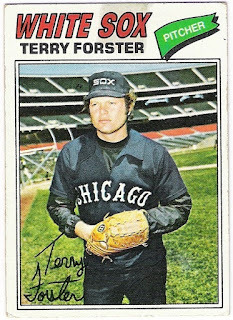 he went from 11-15 in 1976 to 12-7 in 1977, and also lowered his era to 2.62 - down from 3.26 the previous year. he made 31 starts and also made an appearance in relief, recording a save in a july game against the padres. hooton threw a 4-hitter against the mets in may, allowing an unearned run while striking out 11 batters, and also had a 2-hit shutout against the astros in his second-to-last start of the season. 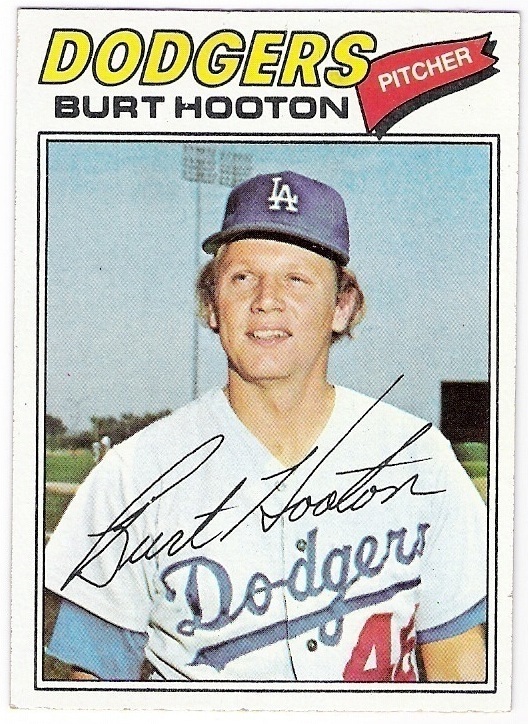 in teh playoffs, hooton had just one start and was relieved after getting just 5 outs in game 3 (the 'black friday' game). his next start came in game 2 of the world series, and he pitched well - allowing one run while striking out 8 yankees and going the distance for the win. 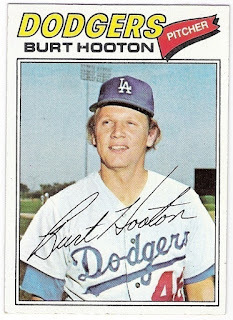 hooton also started game 6, giving up reggie jackson's first of three home runs in the game while being tagged with the series ending loss. unfortunately, hough had a winning record in 1976. in '77, hough went 6-12 with a 3.32 era. he saved a career high 22 games for the blue, and even made his first big league start. it came towards the end of the season against the giants. hough went five innings for the win, allowing two hits and a walk while striking out 5. not too bad. in the postseason, hough appeared in one nlcs game and two world series contests. 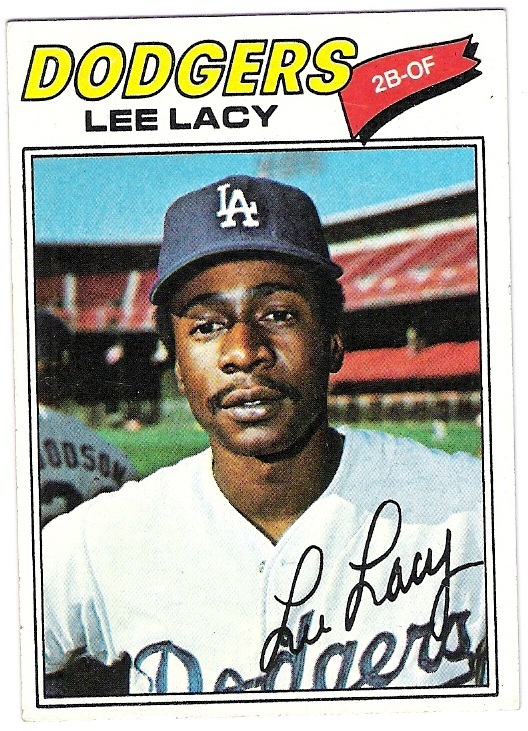 he allowed only 1 run in 5 innings of work against the yankees, but that run came as the third reggie's three home runs. you know, the one that went to deeeeeeeeeeeep centerfield? that one. 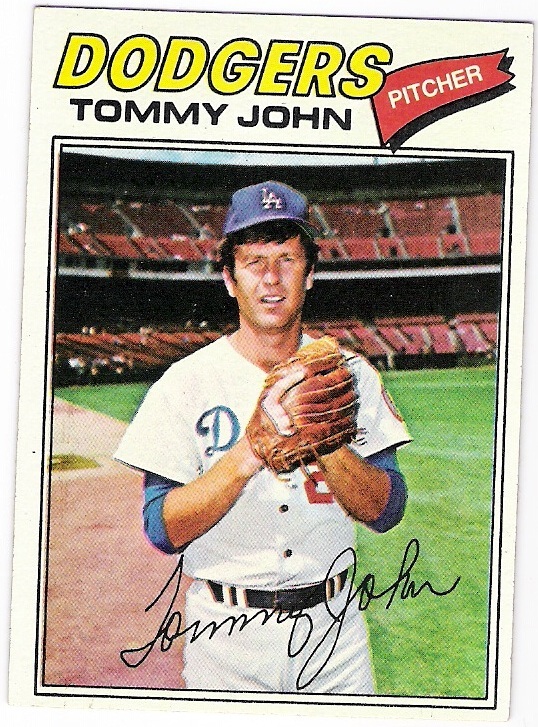 in only his second season back from surgery, john won 20 games for the first time in his career and threw 220.1 innings over 31 starts and wound up second in the nl cy young voting to steve carlton. john had 11 complete games and 3 shutouts to his credit to go with his 2.78 era. he had a stretch of four straight complete games in july and august, capped off with back-to-back shutouts - a 2-hitter against the reds and a 4-hitter against the braves. 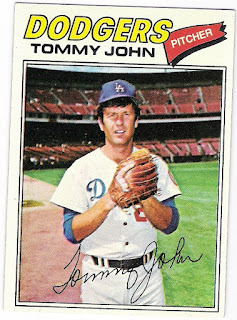 john had missed the dodgers' playoff run in 1974 due to his injury, so 1977 was the first time he appeared in the postseason. he took advantage of the opportunity, starting 2 games in the nlcs and allowing only 1 unearned run in 13.2 innings pitched. in the fall classic, john started game 3 at home but took the loss. as he put together a line of 6/21/.266 in 75 games and shared space on his card with a lurking ed goodson. 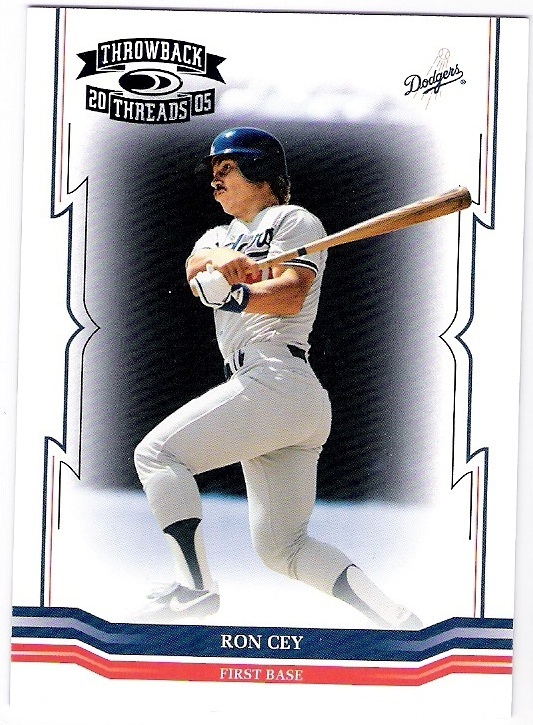 he had some success as a pinch-hitter, too, like his three-run home run off of tug mcgraw in the bottom of the 8th inning of a game in july which proved to be the game winner. he was 1 for 1 in the nlcs as a pinch-hitter, and 1 for 2 with a rbi in the world series in that role, although he was also 2 for 5 with a ribby as a starter against the yankees. 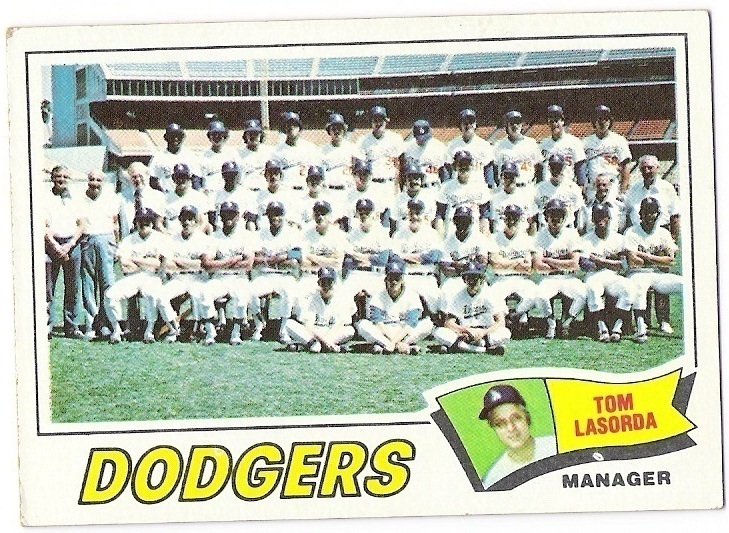 tom lasorda has appeared in these evolutionary posts as a player, a coach, and now for the first time as a manager. he took over for walter alston with just 4 games left in the 1976 season, as you will recall. 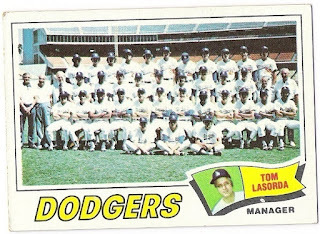 in the offseason, lasorda contacted each of the players and told them what he expected of them in 1977. it turns out he got what he wanted, as the team won 98 games, 10 games ahead of the big red machine. 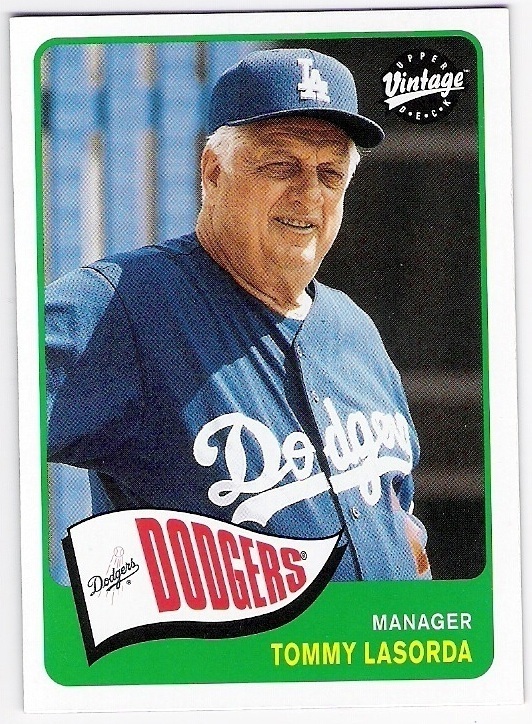 lasorda became one of the few managers to win a pennant in their first season, and was named the upi and ap manager of the year as a result. 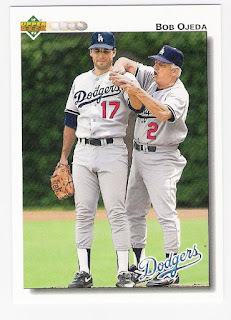 for some reason, he was mic'd up in the world series, and his exchange with doug rau (including an appearance by davey lopes) is a classic lasorda recording. 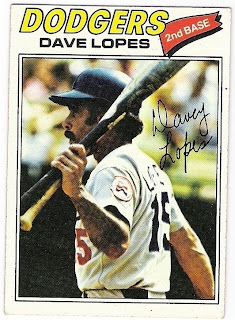 although he didn't lead the league for a third straight year, lopes did steal 47 bases while upping both his batting average and on-base percentage by about 40 points to .283 and .372, respectively. he hit a then-career high 11 homers (4 lead off and 1 walk off) and scored 85 runs. 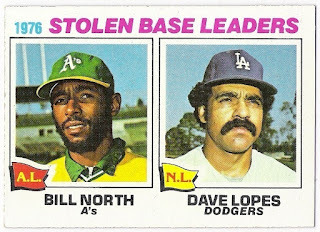 in the postseason, lopes had 3 rbi against the phillies and 2 against the yankees, but stole only two bases and was caught the same number of times. he did come to the mound to try to squelch the argument between tommy and doug rau during the world series, and that counts for something. la brea tar pits? seriously, pinnacle? 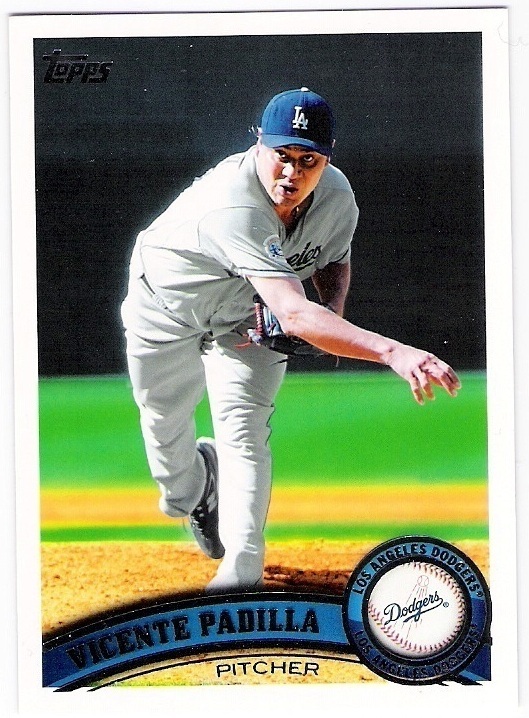 alongside such dodger mainstays as vin scully, tommy lasorda, don drysdale, and sandy kofax (yes, pinnacle does not subscribe to the well known fact that there is a 'u' in 'koufax'), pinnacle in 1997 decided to add a few more things that people might associate with the dodgers. 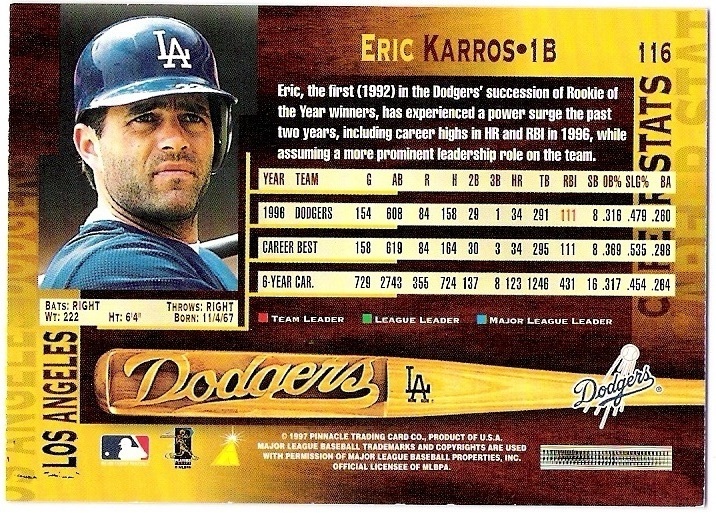 take a look at eric karros' poorly centered card to see if you can read some of them. 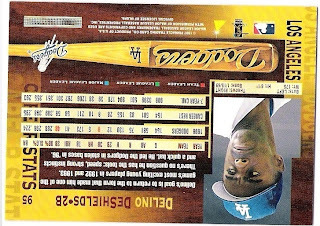 actually, try delino deshield's card, which is a little bit easier to read. dodger blue. the lakers. hollywood. i suppose those make sense if you are playing word association. but mixed in with those, although not entirely on one line, is the phrase 'la brea tar pits'. now, i have been to the la brea tar pits, and they are pretty cool, but that would be pretty low on my list of things i associate with southern california, let alone the dodgers. disneyland. magic mountain. lax. the sunset strip. malibu. heck, the price is right is more socal to me than the tar pits. 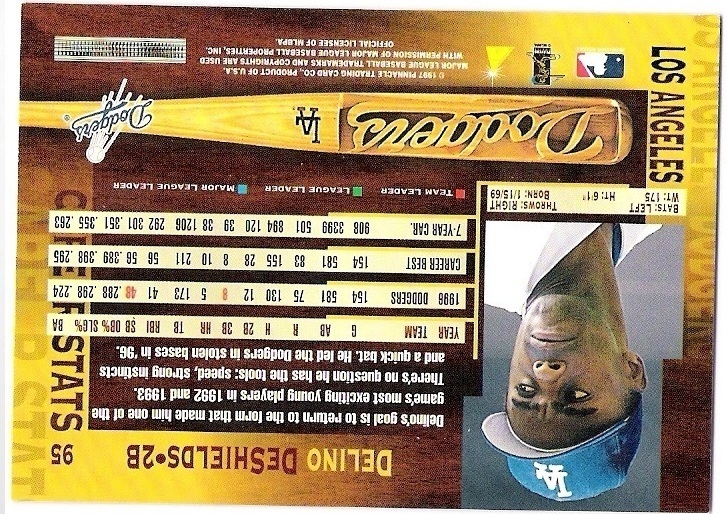 now, the deshields card, like the karros, is in landscape format with the foil printing on the left side. 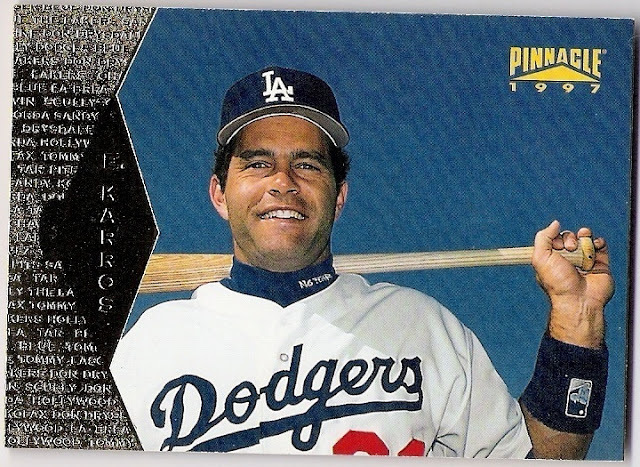 then how come when i turn the deshields card in the same way i turn the karros card the back is upside down? 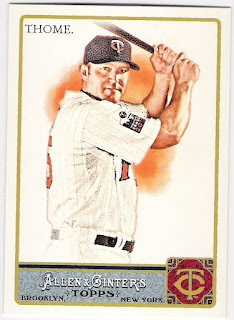 pinnacle's homage to 1953 topps? perhaps. 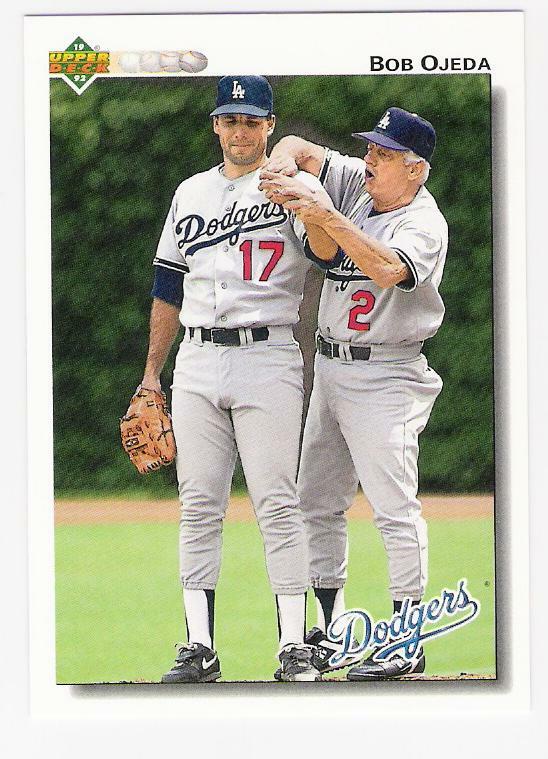 sometimes, tommy lasorda shows up where you would least expect him. 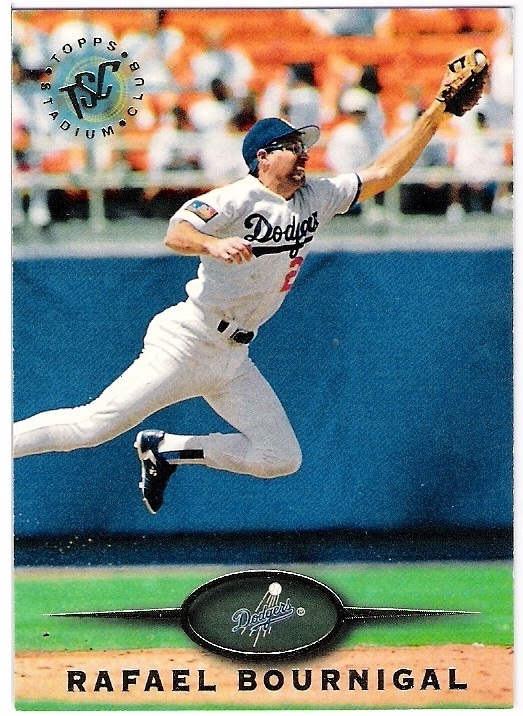 like fielding grounders behind a rookie first baseman on eric karros' 1993 upper deck sp card. although, if i were ojeda, i'm not sure i would take the advice of a guy who was 0-4 on his career. other times, he appears in name only, like on roger mcdowell's 1993 upper deck card. 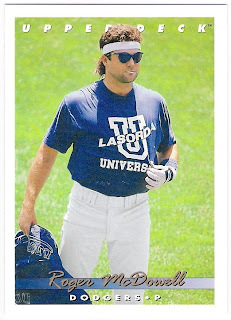 of course, he also fills out cards all on his own as seen on this 2003 upper deck vintage card. hopefully there are some card photographers getting ready to head to spring training. i'd take a boring posed photo with tommy lurking in the background any day. 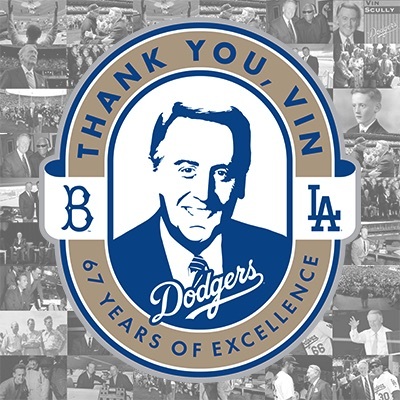 thanks to his status as a dodger double dipper! 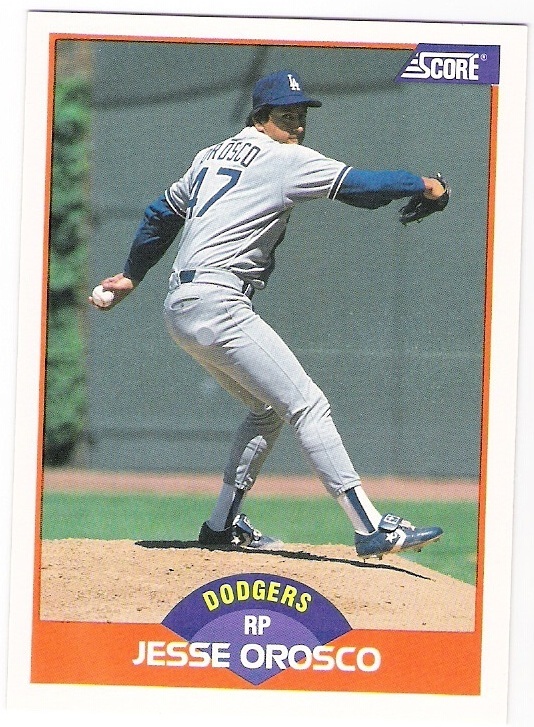 orosco first came to the dodgers in 1988, just in time for his second world series title in 3 years. here's his 1989 score card. orosco teamed with jay howell to lead the dodger bullpen to the fruits of victory in 1988, but he was one and done - leaving la for cleveland as a free agent. orosco stayed for two years this time, appearing in 91 games for the dodgers. by this time, he had already passed hoyt wilhelm and dennis eckersley to claim the top spot on the career games pitched list. 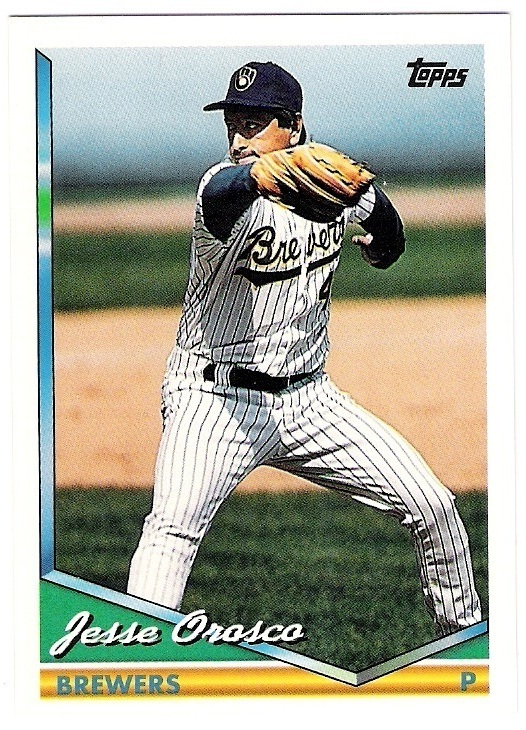 orosco split the 2003 season between the padres, yankees and twins, and although he signed a contract with the diamondbacks after the season ended, he didn't make it back to the majors. 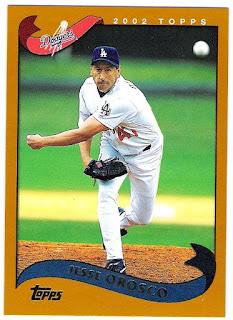 here's to you jesse orosco - another dodger double dipper! 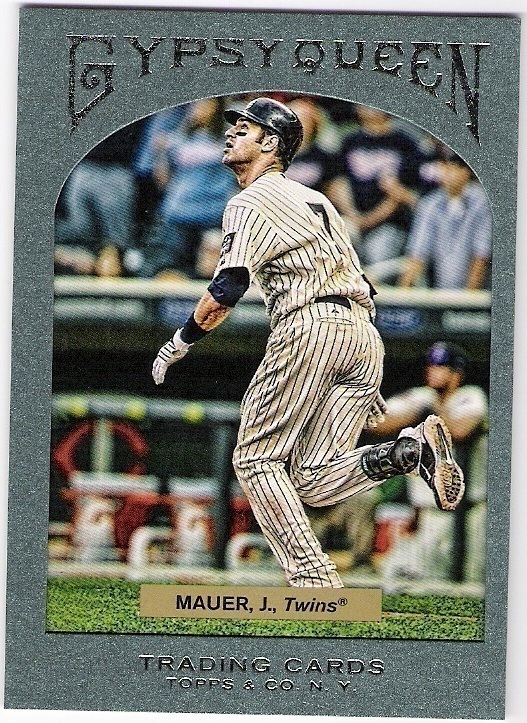 2011 topps joe mauer insert of some sort. i like the persian rug background. it really ties the card together. as we all know, joe struggled mightily in 2011 due to various injuries. i'm hoping he bounces back in 2012.
that's a nice framed parallel. 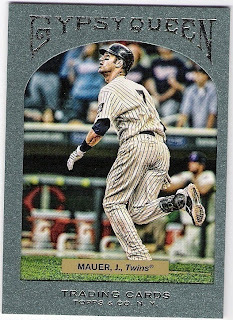 anyway, mauer's time missed meant that the twin faithful were subjected to the offensive mis-firings of drew butera, seen here on a 2010 bowman chrome card. this is one of the reasons they signed ryan doumit and invited pretty much every available catcher to spring training this year. 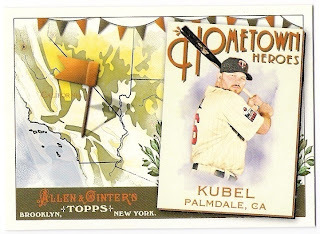 i found the kubel card interesting because the twins always seemed to play up kubel as a dakota boy. i did not realize that, while he was born in south dakota, he played high school ball in california. bautista only has about 420 home runs before he catches up to the killer. 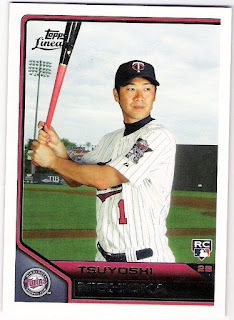 finally, here's a 2011 topps lineage tsuyoshi nishioka. 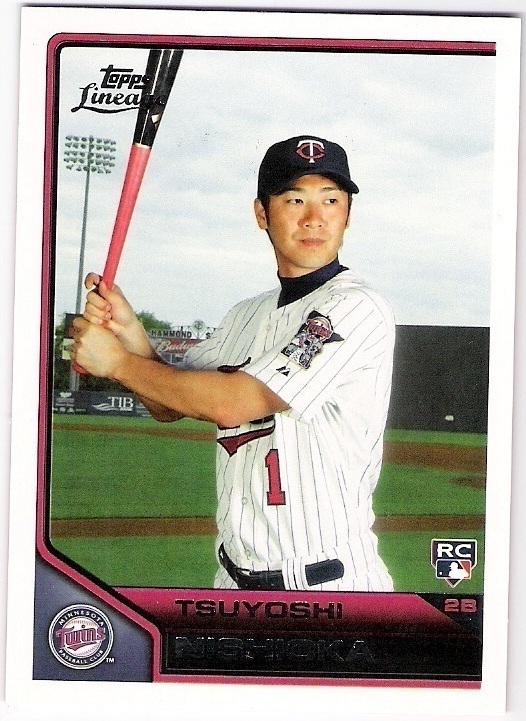 it may be difficult to believe, but his 2011 season may well have been a bigger disappointment than that of mauer or justin morneau. now he has jamey carroll to compete with for a job. thanks for the cards rod! whether meant to be checklist filler or prospecting investments, i have never really been a fan of bowman's attempts at providing cards of players in single a. by the time it all started in the early '90's, i was losing touch with the dodgers' farm system and didn't know who the top prospects were in aaa, let alone rookie ball. 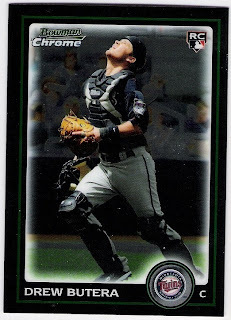 anyway, upper deck seemed to do the same sort of thing in the 2000's, and as a result, i have some cards of players whom i do not know. 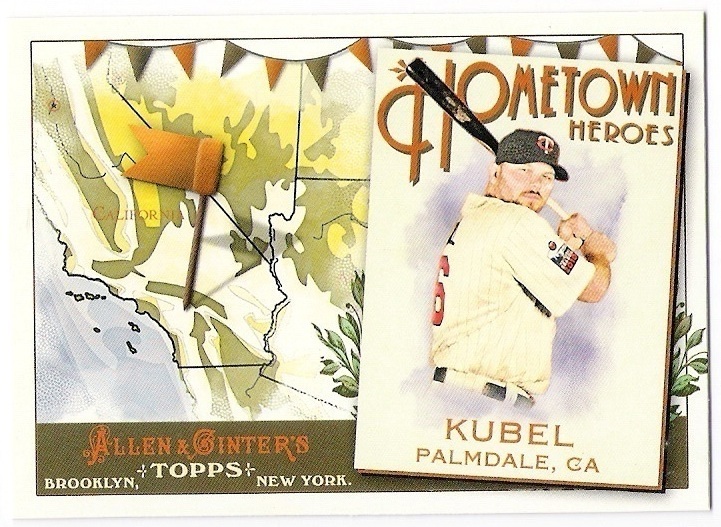 and not just cards, but relics and autos, too. like this 2003 upper deck spx andrew brown jersey and auto card. i was surprised to learn a few months ago that brown actually made it to the majors with the indians and a's later in the decade. also surprised to learn that he was twice traded for milton bradley - first from the dodgers to the indians, and then from the padres to the a's. 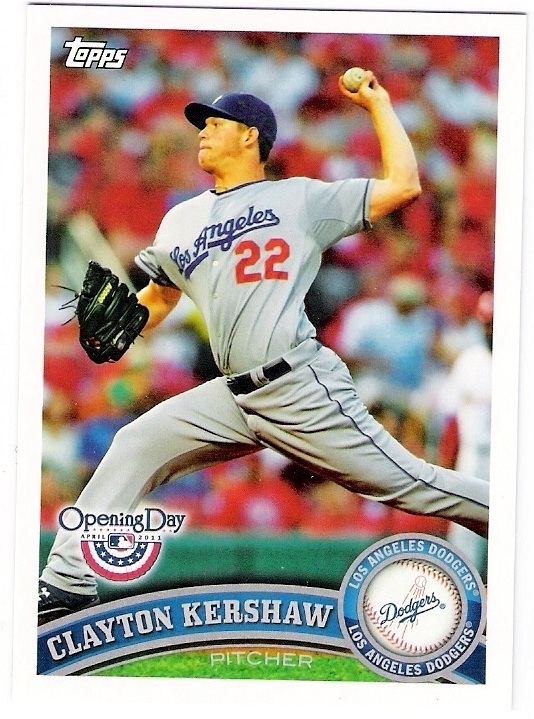 once again, i was surprised to find that he was still pitching professionally in 2010. nothing against brown, he was just never really on my dodger radar. 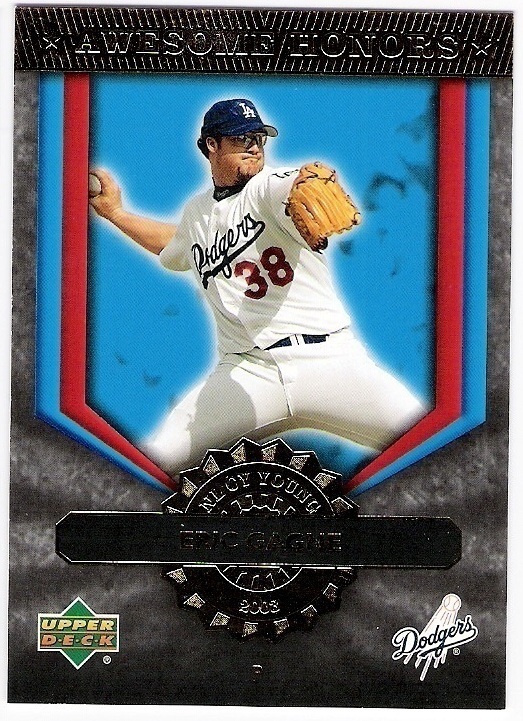 rodriguez made it as high as aaa in 2005 and was most recently pitching in the mexican league in 2010. he may have been injured along the way, as he apparently didn't pitch in 2004. hopefully signing all those stickers wasn't the problem. 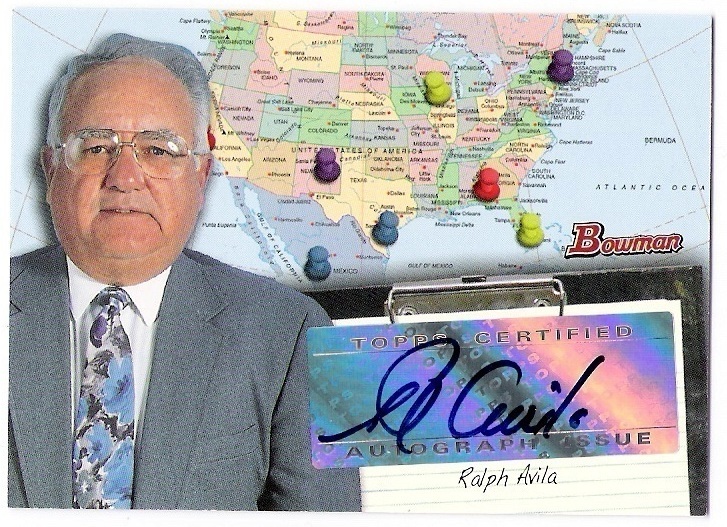 and then, there were the scout autos. i know there was lots of consternation about these cards when they were distributed in 2008 bowman. i mean, who are more little known than scouts? still, i sought this one out. ralph avila has been a scout for the dodgers since 1970, and was the first scout to make a presence in the dominican. he signed pedro and ramon martinez, raul mondesi, and others for the dodgers, and helped establish the baseball academy system that most teams use today. sometimes it's good to know about the little known. as i mentioned the other day, the lucky follower/promoter of my timeless teams blog would fall in at number 7 on the randomizer. so, come on down, mr. laws. you can check him out at my sports obsession, by the way. 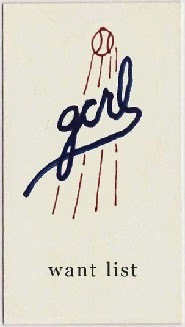 send me your address again, if you would. and thanks to everyone who is following, reading, and/or commenting. keep at it because i'll give away another auto from the set sometime next month. it's probably one of the best cards from the set in my opinion, as it scores high on the team, player, and photo fronts. it's petey. so, if you need some 1981 world series co-mvp in your life, follow timeless teams. read timeless teams. and if so moved, comment on timeless teams. thanks! added a couple of cards showing the flora that currently adorns those blue walls. go back and check it out. now that that is out of the way, we'll visit another part of the stadium that has seen it's share of changes. you all know i'm not referring to the bathrooms. no, it's the outfield walls of which i speak. for most of their existence, the walls were just blue. a nice blue in contrast to the orange and yellow benches in the pavilions. (by the way, welcome to the blog, mr. bournigal. sorry it's taken me so long to feature one of your cards). see that 1995 topps stadium card? nice colors make for a pretty card. 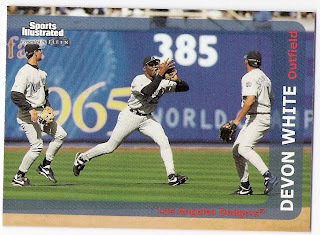 i began to notice in the early 90's, although it may have been happening for who knows how long before that, that the dodgers would adorn the outfield wall with championship banners on opening day. 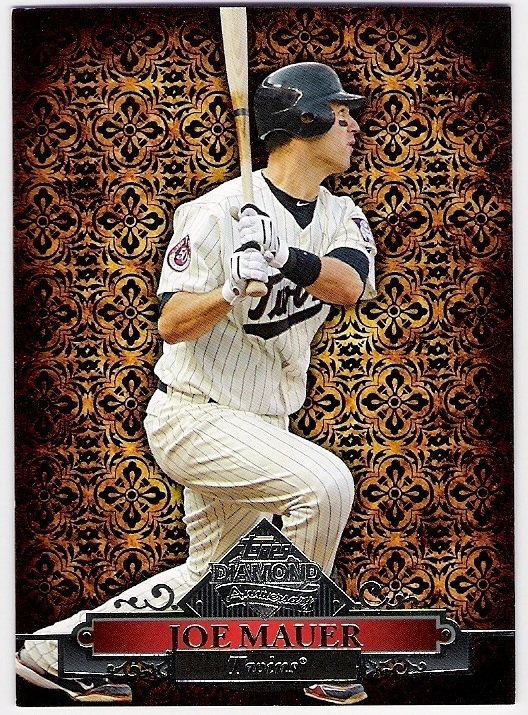 if you look closely at the back of this 2004 upper deck legends timeless teams (shameless plug) card, you can see the big white banners. there would be six in all - 1955, 1959, 1963, 1965, 1981, and 1988 - evenly spaced from left to right field. that was all temporary, though, and the walls would go back to being just blue. 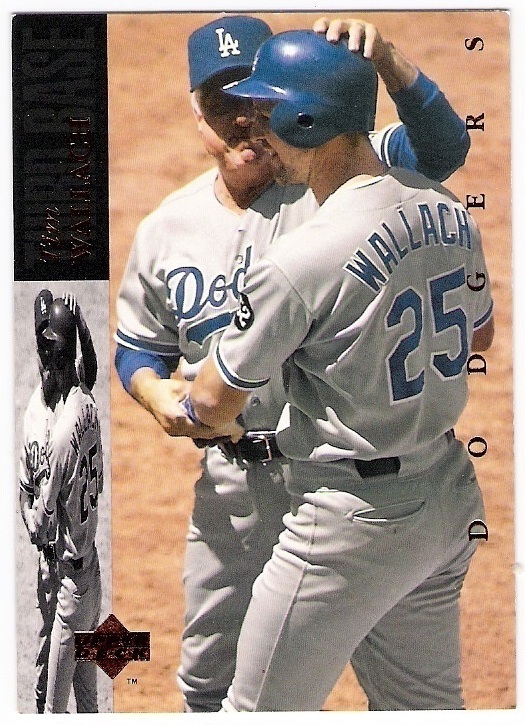 then, in the late 1990's and early 2000's, the dodgers began to use the wall as a canvas for some really great murals. 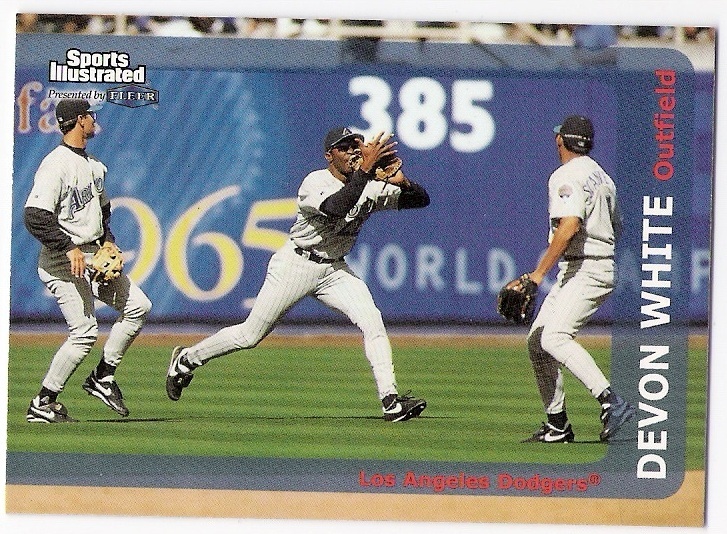 murals that recognized dodger hall of famers one year, cy young award winners another year, or world championships another, as seen on devon white's 1999 fleer si card. the white sox and cardinals and braves have all done something similar. i think it is permanent at the cell and new busch stadium. i like that kind of nod to the past. like a good rug, it can really pull the room together. in 2003, out of town scoreboards were added to the walls near each bullpen. here's hee seop choi's 2004 fleer ultra card to provide some proof. 2004, of course, is when frank mccourt got to town, and he had no use for wasting outfield wall space on murals celebrating the history of the franchise or even just providing a nice color backdrop. no, he needed to sell advertising space, and he went full bore the following year. right julio lugo? right. that reebok ad isn't too obnoxious, i guess. except at night, when the signs are lit. 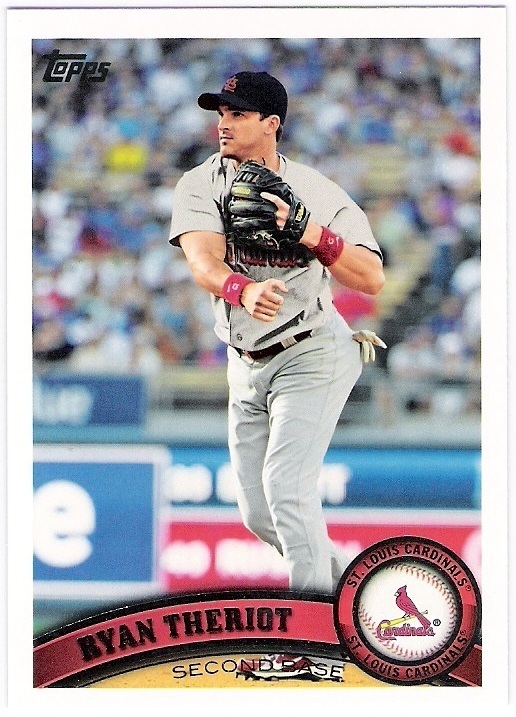 here's ryan theriot's 2011 topps card to show what i mean. yes, that's dodger stadium with theriot airbrushed into cardinal red. 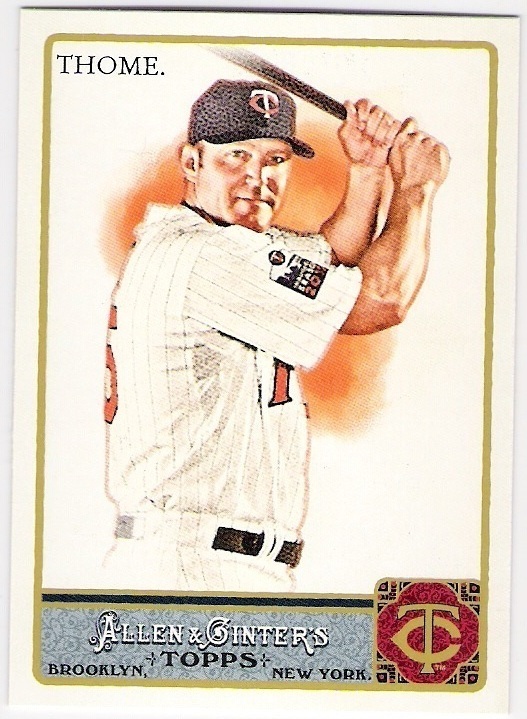 at least topps put him in away grays. i know that revenue is important and that most, if not all, other teams sell space on their outfield walls. maybe, just maybe, however, the new owner could tone it down a bit. or at least roll out the banners for old time's sake. 24 followers (actually 23 since for some reason i am following the timeless teams blog, too) and 3 links hyping the blog (that i know of) prior to january 8. thanks to everyone for the support. remember, there's a steve yeager auto at stake! if you don't follow publicly, or if you linked to the site prior to the 8th, let me know and i'll add an entry for you. regardless, the randomness will happen sometime friday afternoon. in honor of mr. yeager, the 7th name will get the card. as you can tell by the title, i had planned to run this post last year. that's because i had hoped to clear my scanned folder of the trades i had received in 2011 to start the new year. i failed. these dodger goodies came from rhubarb runner in exchange for some twins, i imagine. trade posts are not usually the most interesting posts out there. i'll try for interesting. 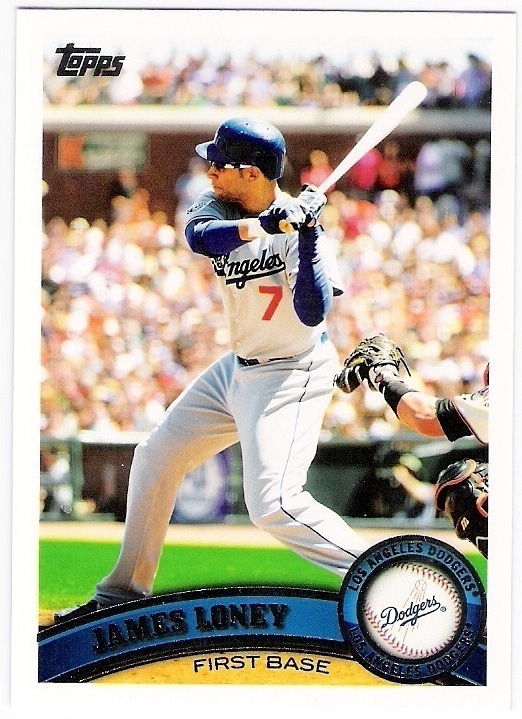 it will be interesting to see how james loney starts the season in 2012. like he did in 2011? or as he finished in 2011? 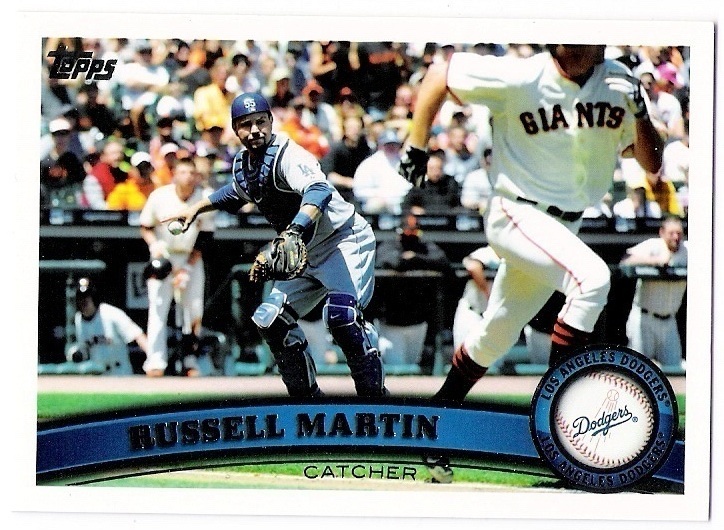 it will be interesting to see if martin continues to have nice looking cards now that he's a yankee. at least we know he will have more cards, anyway. 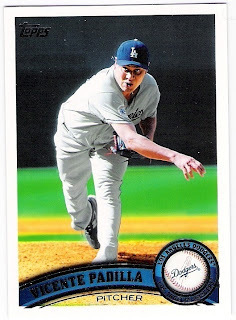 it will be interesting to see whether padilla signs with anyone. supposedly, he is pitching lights out in winter ball. 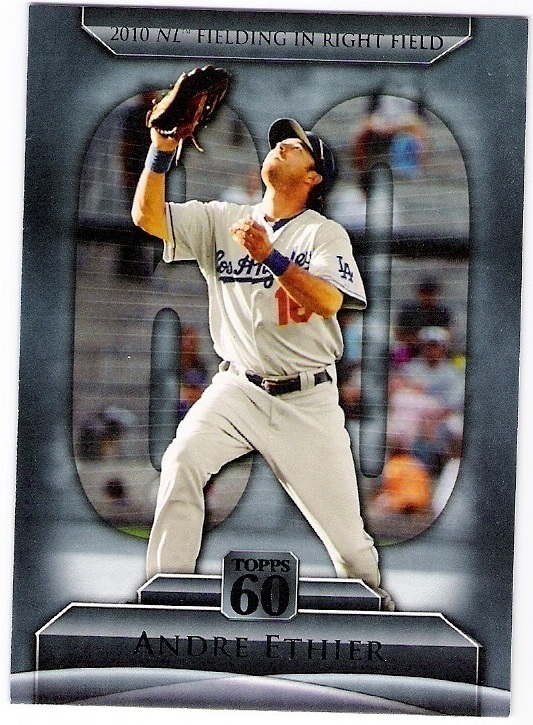 it will be interesting to see if ethier is healthy, and whether ned extends his contract. it will be interesting to see what glut of brooklyn dodger inserts topps gives us this year. 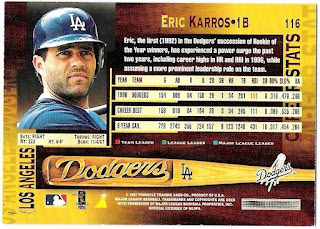 it will be interesting to see if gagne gets any hof votes when he appears on the ballot in 2014.
it is interesting that donruss believes the penguin played first base. not in that infield! thanks rr! i have some more twins ready to go! i love you guys, but enough!